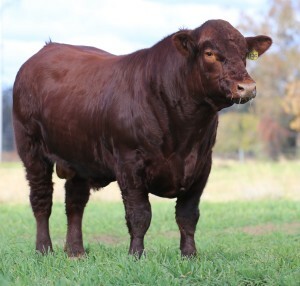 We used this bull over some of our best cows in 2015 and again in 2016. A beautiful deep red, Honey Badger combines wonderful growth figures with moderate birth weight. He has excellent Calving Ease Direct and Calving Ease Daughters figures. His first progeny sold well at the 2016 Futurity bull sale, averaging $10,833 for 6 bulls. He scanned impressively at 600 days with EMA 0f 130 sq cm and Rib and Rump at 14 and 9 mm. Badger's indices are all right at the top of the breed.